Last edited by WannaBeOCer; 03-27-2019 at 01:33 PM. I like how he said in the video, "No tricks. This is real. We're not faking it." Lol. The gaming community has been lied to so much in previews and cinematic previews that he felt he had to say that. Lied by who? Ever since the release of OptiX they announced it's a hybrid method. Only people who feel lied to are those that don't like nVidia. Our solution: hybrid rendering, where select effects are ray-traced to add lifelike lighting, shadows and reflections to the high-fidelity rasterized worlds that developers have lovingly handcrafted for years. RTX is NVIDIA’s new platform for hybrid rendering, allowing the combination of rasterization and compute-based techniques with hardware-accelerated ray tracing and deep learning. It is expected that many use cases will employ hybrid renderers which combine rasterization and ray tracing, so tight integration with an existing rendering API is very important. am i the only one who's not liking the intense disparity between lighted and unlighted spots with RTX? while the lit spots do look "brighter", the dark spots are so dark that it looks like theres not enough ambient light in the surroundings despite there being a ridiculously bright godray right there. imho surfaces are supposed to scatter light towards it's surroundings, e.g. in a dark room point a flashlight towards the floor, the walls and ceiling also gets bright. Last edited by epic1337; 03-27-2019 at 02:19 PM. pretty sure he was referencing the blow back from DLSS. Agreed, right at the beginning the room gets noticeably darker when the light shifts more directly into the room. Before the time shifted though, it looked great, just not enough scattering it feels like, especially with those monster god-rays. Last edited by DNMock; 03-27-2019 at 02:29 PM. Q2VKPT looks fairly Quake like where as this "just throw money at it" approach by NV doesn't look like Quake anymore, it has a different mood, lighting everything. That's fine, so where is the download? Where is the github for it to download it, fork it etc.? Q2VKPT runs pretty damn slow and while it can be made to offer better visuals the performance impact is very high to do so hence I didn't bother with it anymore, it's also not the easiest project to compile if you want to make changes especially on Windows due to how the project build is setup. How many RTX Titans NV had to use to run that video demonstration? 4? What you guys complain about? Darkness in the room when bright light enters it? Saying not enough scattering? Nonsense, it's just HDR conversion to SDR, how much contrast and what function/mapping one uses to do this conversion. The overall brightness isn't static it autoadjust depending on frame content, as in auto exposure. This is used on all HDR games for probably 2 decades or there about, mostly last decade all game engines are HDR rendered and converted to SDR. Only some games actually allow you to change the function and parameters, 99% of them don't. It has nothing to do with rasterized vs traced. Last edited by JackCY; 03-27-2019 at 02:34 PM. What happens to light all depends on the material, shape, and thickness of the object. From burning my feet on concrete I bet it absorbs a ton of solar energy which is most likely why those rooms aren't bright. Last edited by WannaBeOCer; 03-27-2019 at 05:19 PM. 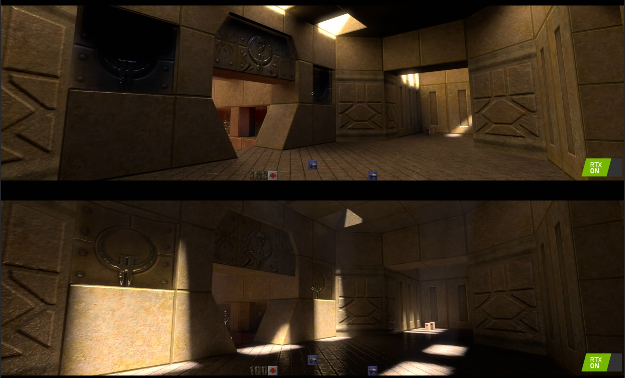 Wasn't it ATI's cards that would downsample Quake 2's textures so it could framerate competitively? yes those are factors, but these game engines doesn't have those variables in it, to them its either zero reflection (blackbody objects) or max reflection (mirrors). for example, in this instance the floor is obviously not a blackbody object. but once the lightsource points down towards the floor the room darkens too much, theres zero reflectivity on the floor. Last edited by epic1337; 03-27-2019 at 06:37 PM. The developers can set factors and from the pitch black corners in the demo they have them set. I know this is using nVidia's VKRay but I'm sure nVidia also are able to set the material. The second step in using DXR is to create the raytracing pipeline state. Today, most games batch their draw calls together for efficiency, for example rendering all metallic objects first, and all plastic objects second. But because it’s impossible to predict exactly what material a particular ray will hit, batching like this isn’t possible with raytracing. Instead, the raytracing pipeline state allows specification of multiple sets of raytracing shaders and texture resources. Ultimately, this allows an application to specify, for example, that any ray intersections with object A should use shader P and texture X, while intersections with object B should use shader Q and texture Y. This allows applications to have ray intersections run the correct shader code with the correct textures for the materials they hit.